Plot: After the Jupiter 2 spacecraft is badly damaged by a meteor shower while traveling from Earth to Saturn, the crew is forced to land on an alien world. There, they befriend the Throgs, a peaceful froglike race under siege from the mechanical race known as the Tyranos. 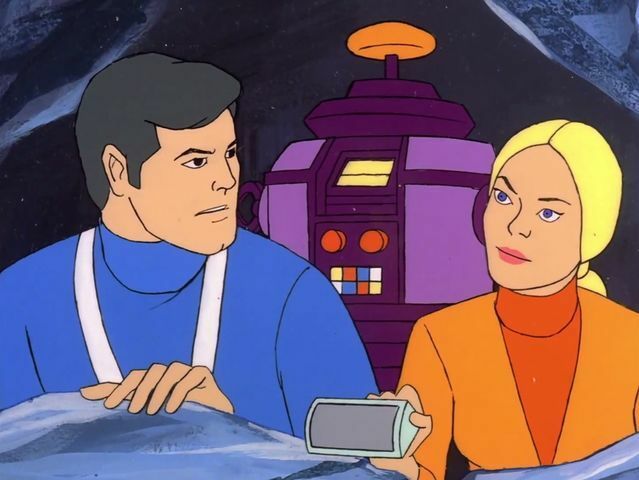 Richard’s Review: Just a few years after the demise of the original Lost in Space series, Hanna-Barbera acquired the rights from Irwin Allen to produce a Saturday morning animated version that would be a loose adaptation. The Robinson family was mostly gone and Major West was nowhere to be seen. 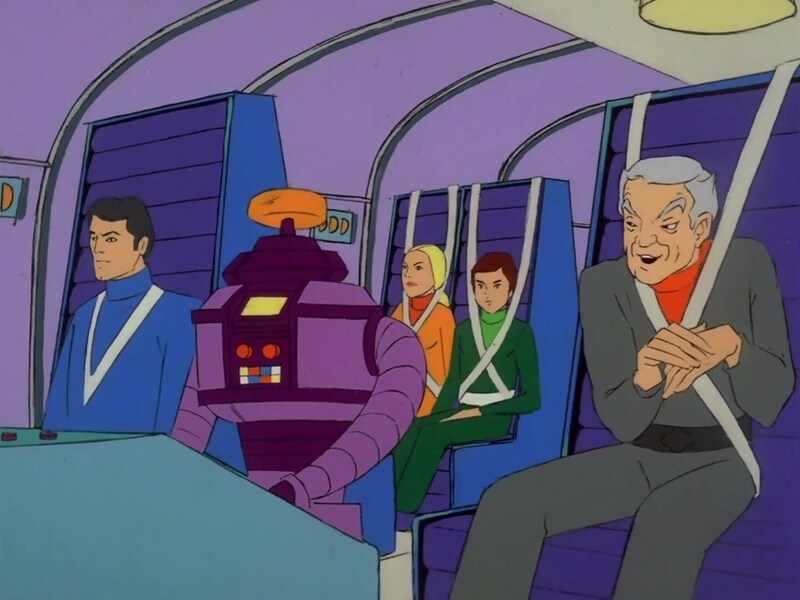 However, we have Craig Robinson (a mix of John Robinson and Don West) as the pilot of the Jupiter 2 shuttle with his younger brother Link (aka Will Robinson) tagging along on a routine mission to Saturn. They are taking geologist Dina Carmichael (aka Judy Robinson) there for her new assignment while Earth biologist Dr. Zachary Smith (the only character who really didn’t change) seems along for the ride. Robot is present but is now more of a pilot and has been given the name…Robon. At 45 minutes, this pilot episode seems a lot longer due to a meandering plot written by Fred Freiberger (the man behind the disappointing third season of Star Trek). The story comes across as dull and certainly not engaging enough for fans to want more. It would have made more sense to keep the characters the same but it still could have worked with a better writer. As it is, it’s now just an oddity worth watching once to say you did but repeated viewings seem unlikely. Karla’s Thoughts: While I really enjoyed the Hanna-Barbera animation style, I thought the story was atrocious. It was boring and seemed much longer than it really was. It also made no sense not to use the original characters. That said, they overused Dr. Smith, having him say every familiar line from the series while serving little purpose in the overall story. Definitely not something I would watch again. The new Jupiter 2 resembles more of a shuttle and nothing like the original saucer-like craft from the original series. Robon looks very similar to the original Robot but with a smaller head and a more high-pitched robotic voice. This aired on Sept. 8, 1973, as part of the shortened second season of the ABC Saturday Superstar Movie, which produced several now forgotten specials, including an animated take on Mad Monster Party?and the Groovy Goolies meeting Daffy Duck and Porky Pig. You’ll recognize many familiar Hanna-Barbara musical snippets, including several used frequently on The Super Friends. Availability: While never released on home video, it is currently available in excellent quality on YouTube for free. 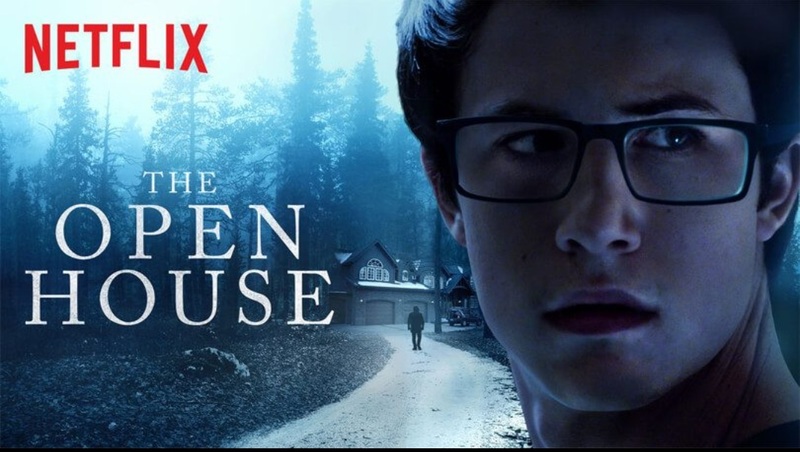 This week on episode 560 of the Dread Media Podcast, I take a look at the Netflix original called The Open House (2018), starring Dylan Minnette (13 Reasons Why). It’s sure to leave anyone selling their house wondering what happens in their home while they are gone. As always, be sure to tell ’em Monster Movie Kid sent ya! 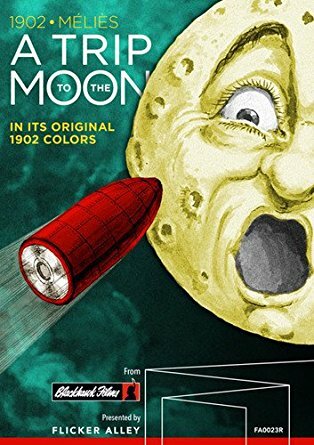 Plot: A group of men build a rocket and travel to the moon, where they discover it’s inhabited by moon creatures. Will they escape to return safely to Mother Earth? Richard’s Review: At a running time of just 16 minutes, this short feature has never looked better. With a restored color-tinted print, it is a brilliant showcase of a genius before his time. While the film is certainly dated (it is 116 years old after all), it remains as amazing as ever and a true symbol of celluloid ingenuity that is sorely missing in many filmmakers today. And while I normally prefer a more traditional score, musical duo Air do a fantastic job of creating mysterious and innovative music that enhances the journey. Highly recommended! Karla’s Thoughts: The special features are an absolute must, with the 65-minute documentary, The Extraordinary Voyage, telling the sad yet incredible story of George Melies. It should be viewed before the movie as it will make you appreciate it even more. I was also surprised by the bright colors in this print. I thoroughly enjoyed it! Bonus Recommendation: Karla and I both recommend you also watch Hugo (2011) for an interesting tale that weaves the story of George Melies with the story of a young boy named Hugo (Asa Butterfield). It’s a beautifully made film by Martin Scorsese that is both fantasy and informative. Plus, Sir Ben Kingsley is wonderful as George Melies. 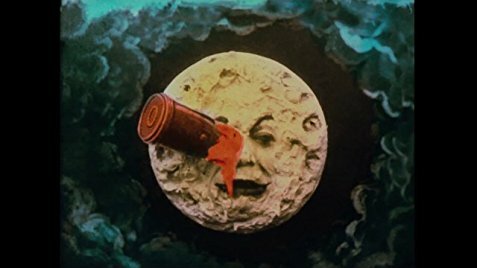 In 1898, George Melies produced the first version of A Trip to the Moon, which featured an astronomer looking at the moon through a telescope. Elements from the Jules Verne novel, From the Earth to the Moon, are interwoven ever so loosely into the script. George Melies never made any money from this classic film, due in large part to Thomas Edison making illegal copies of the film for distribution in the United States. While Melies made more than 500 films, only 300 or so still exist. Considering Melies destroyed his own copies of the films out of anger over being pushed out of filmmaking, it’s a miracle any of his films still exist today. Although prints of the film existed for years, the first color-tinted print was discovered in 1993. It was only in 2010 that technology allowed a complete restoration of the original color-tinted prints. Availability: Flicker Alley originally produced a special edition Blu-ray in 2012, but it soon went out-of-print and prices skyrocketed. Thankfully, a new edition has just been released with all of the special features still intact. 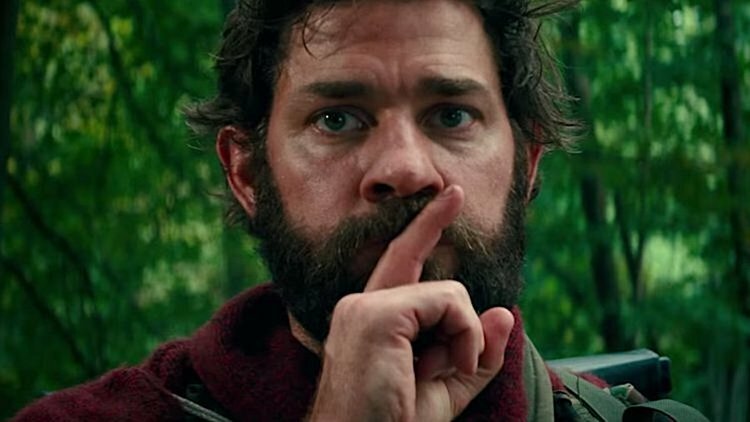 Last summer, I embarked on a summertime journey to watch a nice stack of sci-fi and horror movies that had been on my “to watch” list for awhile. Sadly, the journey got sidetracked by real life. This year, the summer of 2018 looks a lot calmer (knock on wood) so Karla and I are loading up the intergalactic Winnebago to embark on the 2018 Sci-Fi Horrorfest. There’ll be new flicks, revisits and a few surprises. From Harryhausen to giant ants, it’s going to be a fun trip! The first stop is tomorrow as we travel back about as far as we can go…to the year 1902! So get the popcorn popping and the Coca-Cola chilling as we fire up the projector at warp speed! 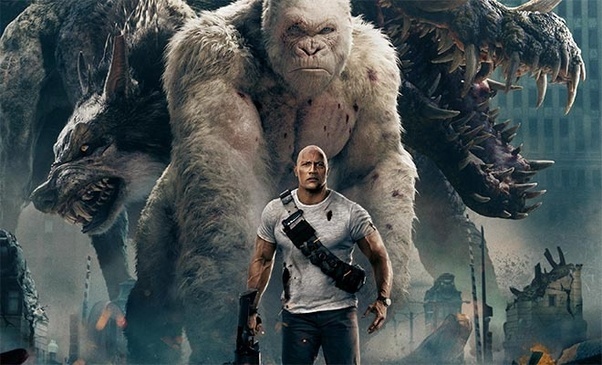 This week on episode 559 of the Dread Media Podcast, I take a look at Dwayne ‘The Rock” Johnson’s latest big screen epic Rampage (2018). Yes, it’s loosely based on the old arcade game and it definitely delivers on the big monster quota. Tune in to check out my thoughts and be sure to tell ’em Monster Movie Kid sent ya! What’s that buzzing you hear? What does that spider have captured on it’s web? 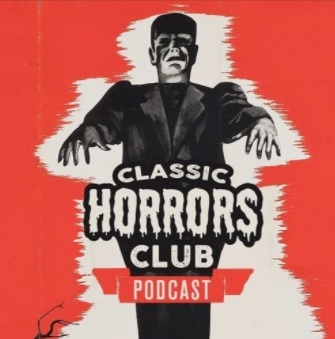 This month on episode 18 of the Classic Horrors Club Podcast, Jeff and I sit down to talk about The Fly trilogy. 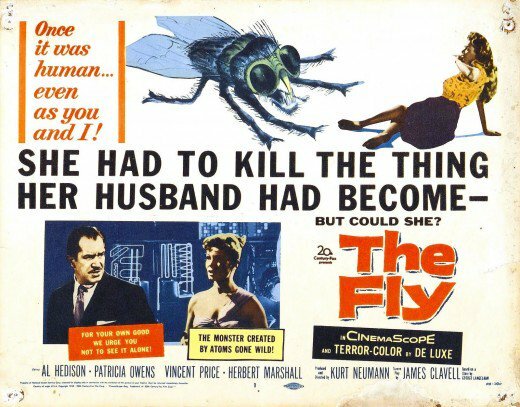 We start with the two Vincent Price classics, The Fly (1958) and Return of the Fly (1959), before wrapping up with Curse of the Fly (1965).